This name uses Spanish naming customs: the first or paternal family name is Rojas Alou and the second or maternal family name is Beltré. Moisés Rojas Alou Beltre (/ˈmɔɪzɪs əˈluː/; Spanish: [moiˈses aˈlo.u]; born July 3, 1966) is a Dominican-American former outfielder in Major League Baseball who played for 17 seasons in the National League. In 1,942 career games, Alou had a batting average of .303 with 2,134 hits, 421 doubles, 332 home runs, and 1,287 runs batted in. His father Felipe, who managed Moises with the Expos from 1992 to 1996 and the Giants from 2005 to 2006, as well as uncles Matty and Jesús, and cousin Mel Rojas, all had long careers in Major League Baseball. In 2008, he was one of four active major leaguers (along with Prince Fielder, Ken Griffey, Jr., and Daryle Ward) to hit 20 home runs in a season whose fathers had also hit 20 home runs in an MLB season. He is the youngest of three sons born to Felipe and his first wife Maria Beltre, who raised him in the Dominican Republic after his parents divorced when he was two. Alou is married to Austria Alou; they have three sons: Percio, Kirby and Moisés Jr.
Alou is one of the few baseball players who batted without the use of batting gloves. Instead, Moisés Alou revealed that during baseball season he'd urinate on his hands to toughen them up. Alou was also known for pranking teammates while they were sleeping in the locker room. At the age of 18, Alou was more interested in playing basketball during his youth, and did not play organized baseball until he attended Cañada College in Redwood City, California. It was there that baseball scouts noticed his bat speed and speed on the basepaths. In 1986, Alou was the second overall pick in the MLB January Draft - Regular Phase, chosen by the Pittsburgh Pirates. In 1990, he was traded to the Montreal Expos where he would later play under his father while he managed the Expos. Alou suffered a severe ankle injury in 1993 that would rob him of his speed and force him to become strictly a corner outfielder. He recovered in 1994, hitting .339 and had the game-winning hit in that year's All-Star Game. For the next two seasons, he would enjoy success at the plate in Montreal, although surgery to both shoulders prematurely ended his 1995 season. Prior to the 1997 season, Alou signed as a free agent with the Florida Marlins, where he led the team with 23 home runs and 115 RBIs. The Marlins made the playoffs as a wild card team, and defeated the San Francisco Giants in the National League Divisional Series, and then the Atlanta Braves in the National League Championship Series, before going to the World Series, which Florida won in seven games. Alou led the team by hitting .321 with three home runs and nine RBI in the World Series (although, pitcher Liván Hernández, by virtue of his wins in Games 1 and 5 was named the Series Most Valuable Player instead). Before the 1998 season, the Marlins traded Alou to the Houston Astros. In his first season with the team, Alou hit a career-high 38 home runs and drove in 124 runs while leading the Astros to a (then) franchise record 102 wins. However, he tore his ACL in a treadmill accident in the offseason, and missed the entire 1999 season. Once recovered, he returned to the Astros lineup to hit .355 in 2000 and .331 in 2001, while driving in at least 108 runs in each season. After the 2001 season, the Astros did not offer Alou a new contract, making him a free agent. In December 2001, he inked a 3-year, $27 million contract with the Chicago Cubs. In 2002, Alou again ended up on the disabled list at the start of the season, and once healthy, he hit .275 and 15 home runs. After the 2002 season, Alou, hired a personal trainer and dedicated himself[vague] to return to his old form. In the 2003 season, Alou batted over .300 for most of the season while driving in runs as he used to[quantify], before a late season slump dropped his season batting average to .280, with 22 home runs and 91 RBIs. Alou went on to lead the team in average in its two series against the Atlanta Braves and Florida Marlins. In Game 6 of the National League Championship Series against the Florida Marlins that year, Alou was involved in the Steve Bartman incident, in which a Cubs fan named Steve Bartman deflected a foul ball landing one row into the stands, preventing Alou, who reached into the stands, from attempting to catch the ball for an out that could have been the second out of the 8th Inning. However, the Marlins went on to score eight runs in the inning, which the Cubs had led 3–0. The Cubs, who had led the series 3–2, lost the game 8–3 and eventually lost the series in seven games. Alou openly admitted later in interviews that while he was frustrated at the moment, he could not have made the catch anyway. Later he denied making such a statement and said if he had, it was only to make Bartman feel better. In 2004, Alou set new career highs in home runs (39) and doubles (36), while driving in 106 runs. However, the Cubs missed the playoffs after losing seven of their last nine games. The Cubs refused to offer arbitration and let him go, citing numerous fights with umpires who, he claimed, had a vendetta against him. 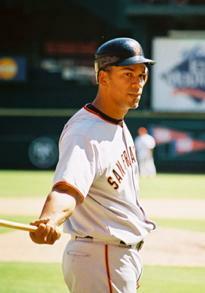 In October 2004, Alou announced that he had talked to his father, Felipe, about possibly playing for him and the Giants next season. In December 2004, he signed a one-year deal with the Giants worth $13.5 million, with a player option for a second year. Alou was expected to regularly play in right field for the first time since 2001, but due to injuries to left fielder Barry Bonds, he started most games in left field. 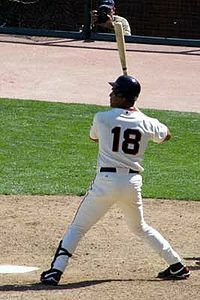 Alou had stated that he would retire if the Giants won the World Series in 2005. They did not, and Alou exercised his option and stayed with San Francisco in 2006 season, hitting 22 home runs and 74 RBI. On November 20, 2006, the New York Mets signed Alou to a one-year contract worth $7.5 million with a club option for 2008. After hitting .318 in his first month as the regular left fielder, Alou suffered a torn quadriceps muscle, and was forced out until August. Upon his return, Alou led the Mets with a .345 batting average and had a 30-game hitting streak. The streak was the longest streak of the 2007 season, was the longest hitting streak by a player over age 40, and broke the Mets' overall and single-season hitting streak records. On October 31, 2007, the Mets exercised their option on Alou's contract for the 2008 season. "Last year, Moises showed us what type of hitter he was", said General Manager Omar Minaya. On March 5, 2008 Alou underwent hernia surgery and missed the start of the 2008 season. On July 9, Alou suffered a torn right hamstring playing in the outfield for AA Binghamton in Norwich, Connecticut. Mets general manager Omar Minaya stated in a press conference the following day that Alou would likely need surgery and miss the remainder of the 2008 season, which ended his career. On March 5, 2009, Alou announced that he would retire after the World Baseball Classic. ^ O'Brien, David (March 15, 1997). "The Son Moves On". Sun-Sentinel. ^ Haglund, David. "Can peeing on your hands make them tough?". Slate Magazine. Retrieved 2012-11-27. ^ "Order Cialis UK Online – FDA APPROVED Drug Store". Baseballlibrary.com. Archived from the original on 2012-10-20. Retrieved 2012-11-27. ^ "Alou says he wouldn't have caught Bartman ball in 2003 NLCS". ESPN.com. April 1, 2008. Retrieved July 9, 2008. ^ "Report: Alou says he would have caught Bartman ball – MLB – ESPN". Sports.espn.go.com. 2008-06-03. Retrieved 2012-11-27. ^ "Mets bring back two veterans - Mets.com: News". ^ Hubbuch, Bart (July 10, 2008). "Alou out with torn hamstring". New York Post. Archived from the original on September 24, 2008. ^ Shpigel, Ben (February 29, 2008). "Mets Unveil Their Own Health Plan: Keep Alou on the Field". The New York Times. Retrieved May 13, 2010. ^ Goold, Derrick (2009-03-05). "Alou set to call it a career". St. Louis Post-Dispatch. Archived from the original on 2009-03-06. Retrieved 2009-10-21. Wikimedia Commons has media related to Moisés Alou. This page was last edited on 13 April 2019, at 07:11 (UTC).